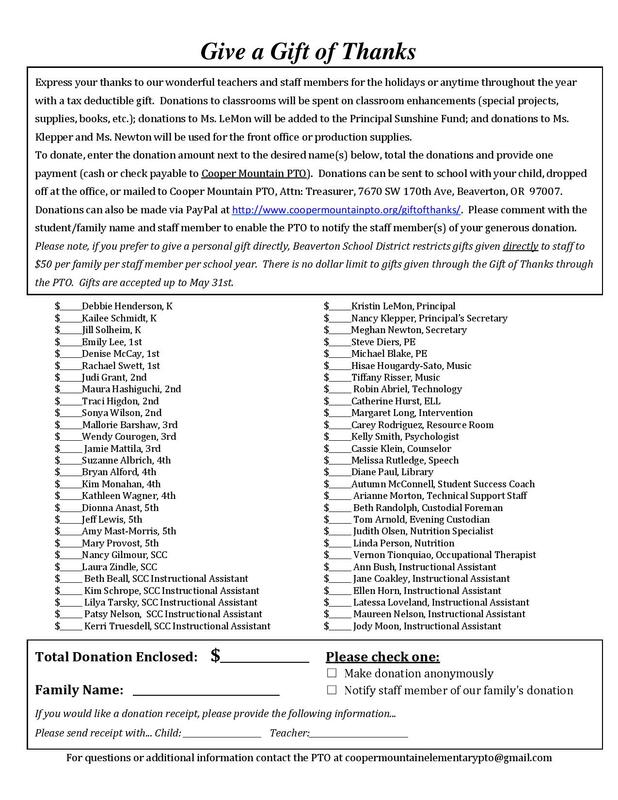 Give to your student’s teacher or to any teacher or staff at Cooper Mountain Elementary for the holidays or any time through the year to show your gratitude for all the hard work they do. Donations given to teachers will be spent on classroom enhancements and supplies; donations to Mrs LeMon will go to the Sunshine Fund; and donations to Mrs Klepper and Mrs Newton will go to front office and production supplies. Donations can be made by cash or check along with the form below either in person or by mail to Cooper Mountain Elementary. Donations can also be sent through PayPal, please add a note that your donation is for the Gift of Thanks and include your student’s name and the teacher or staff to whom you are donating! Click here for a printable PDF of the Gift of Thanks form!